Avidasports™ is a swim training technology that results in unmatched accelerated improvement in times for all swimming events and distances. The feedback the swimmer and coach receive “real time” during training sessions on predetermined performance measurement targets creates the ultimate accountability to results. The swimmer receives audio feedback from the coach AND the computer – all while the system is calculating and trending length-by-length swimmer analysis of key performance metrics for the entire season for up to 100 swimmers – simultaneously. Practice now trains the brain, not just the body. Swimmers learn “what works” much faster than before and builds “muscle memory” during training that can be applied race day. Simply, the use of Avidasports results in one personal best after another at a faster rate, regardless of the level of swimmer. In the end, it’s all about using technology to not only win but also to make the coach’s job easier by providing an in-water tracking tool. Now each lap matters. It’s time to swim smarter, faster. Avidasports™ wins. Avidasports™ makes swimmers faster by developing neural reconditioning which increases performance by linking mindset and technique to results. Worn on the swimmer, our wireless athletic telemetry devices allow swimmers to hear real-time how they are performing each length. Further, the coach can communicate with each swimmer while watching six different performance metrics at one time on a laptop allowing the swimmer and the coach instantaneous feedback at any time during the training session. Swimmers who know exactly how they are swimming as it relates to length time, stroke count, tempo and other metrics make predictability and replication far easier on race day. Coaches have a powerful tool to lead, motivate, and teach! Avidasports™ provides quantum advancement in the training regimen by neural reconditioning; now every length has a specific meaning. Metrics to analyze each length increases the swimmer’s accountability, improving workout effectiveness. Training history and trends are readily available. A single coach has streamed data and historical analysis for up to 100 swimmers immediately available that can be used for continuous improvement, goal tracking and positive reinforcement. Workout routines can be altered and the impact of the change measured allowing the coach a tool to optimize a training plan for each athlete, what gets measured gets improved. Swimmers don’t just train, they learn! Each practice is now a significant learning opportunity because the athlete is measured during each length. Focusing on metrics during each length reinforces faster learning. Muscle memory creates successful training routines making predictability and replication far easier on race day. Swimmers recondition their brain’s neural networks so new habits match desired goal thoughts. Swimmer can engage in post-practice review of each length in as little as 10 minutes, overall trends of metrics along with replaying coach audio comments bookmarked to the exact moment in the workout. Using data from past practices, swimmers can develop new ideas with their coaches for subsequent practices to experiment with training changes. Athletes can benchmark split times and other data against personal goals and competitors. Clubs and Schools – Avidasports™ proves a commitment to excellence! Progressive thinking is immediately inferred when implementing Avidasports™, the pioneer in Athletic Telemetry™. Current athletes and new recruits will have a clear vision how the program’s training plan provides a path to excellence using state-of-the-art technology. 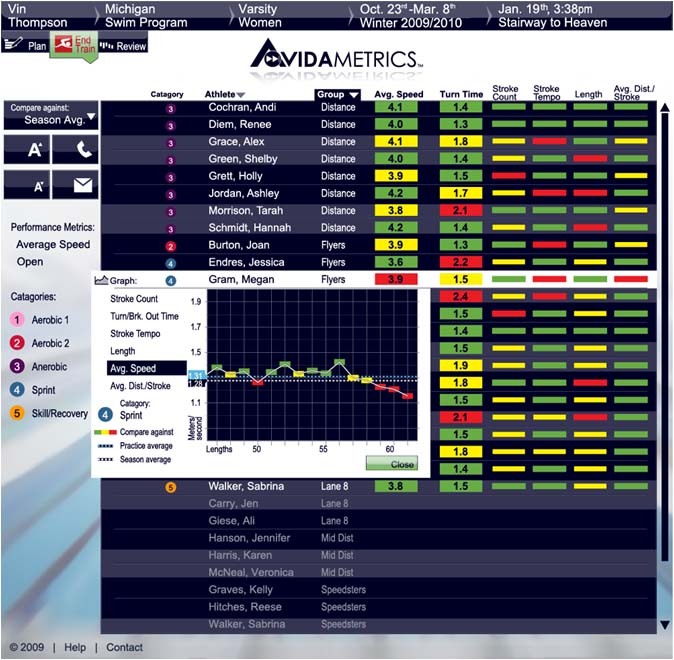 Coaches and administrators will have objective evidence on improvement to demonstrate the return on investment with the Avidasports™ solution. Avidasports™ promotes effective communication between swimmer and parents. 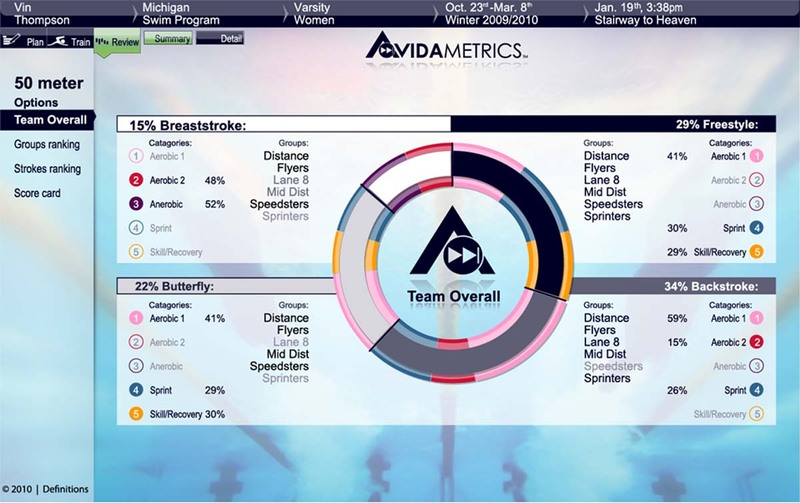 AvidaMetrics uses athletic telemetry to collect eight (8) key performance metrics in real time for your entire team eliminating the need to manually collect and calculate performance data! Select benchmark metrics for audio feedback to be heard during practice. Establish training groups to easily monitor your swimmers real time data. Archive season workouts viewable by coaches and swimmers. Monitor your entire team to instantly see how your athletes are performing during training. 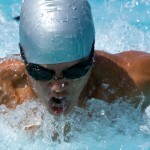 Performance metrics captured include swimmer’s pace (speed), stroke count, avg. stroke tempo, avg. distance per stroke, length time, and breakout time. Select two performance metrics for the system to communicate directly to your swimmers. After every length, each athlete will have precise training feedback feedback that can be seen by multiple coaches simultaneously. Talk live to an individual swimmer or a group of swimmers while they train. Coaches and athletes can log into the Review module after training to review over 12 graphs and charts. Look at a single practice, a weeks worth of practices, or the entire season to track improvement over time. Athletes can also compare their training performance with others on the team. Analyze additional metrics such as kick count and average kick tempo in the Review module. Replay coaches calls or voice messages to the individual swimmers.